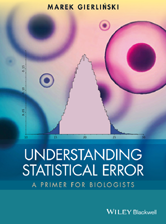 This accessible introductory textbook provides a straightforward, practical explanation of how statistical analysis and error measurements should be applied in biological research. Why do we need to evaluate errors? Where do errors come from? What is a statistical estimator? Confidence interval: what does it really mean? When can you get away without error bars? What is propagation of errors? To use error propagation or not?